It’s only the first week of summer, but already I have several faves. They run the gamut, so be warned there’s no real rhyme or reason other than it’s SUMMER! 1. The free section of Craigslist! We’ve been searching for a play structure for Mark for a few weeks now. Most of the ones we liked online that were new were SUPER expensive, or they were the wooden ones that would take up literally our entire yard. When I was searching Craigslist the other day, I found one of those really sketchy listings where it doesn’t show the picture of the “free” thing; you just have to come and check it out yourself. After it got the Ryan seal of approval, he brought it home, employed the power-washer from the farm, and voila! This will be where he plays for the whole summer, I think. We were playing bocce. He’s explaining something about triangles and geometry, but all I can hear is that I didn’t score any points this round. This is Tumalo Falls just outside of Bend. Beautiful hike! While we were playing bocce, there was a deer not ten yards away from us. So cool! Mark obviously had a great time with his Grandma while we were away. 3. All the delicious green things. I know I said green things, but I LOVE salads with berries. This is the first one I made this year (baby greens, berries, almonds, olive oil, and white balsamic vinegar). Why, yes it was as delicious as it looks, thanks for asking! I’ve been trying to de-stash my yarn by making baby hats to donate (to the hospital? a maternity home? 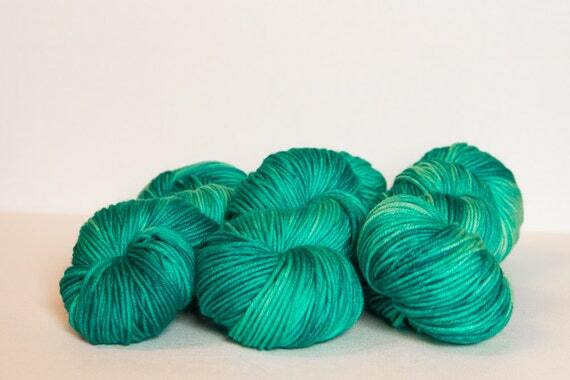 I’m not sure yet), but I’m swooning over this yarn that I found on Etsy. You should totally go check out this girl’s store. It’s amazing. If you’re up for reading some other faves, go check out Heather’s host-post. What a great Craigslist freebie! That section in our area only ever seems to have dogs and cats! Congrats on 3 years together! Every Year together is a blessing and should be celebrated!